This exhibition comprises sculpture, installation, paintings, drawings, and sketchbooks that chart Aggie Zed’s unique working methods in a variety of media. Born in Charleston and raised among farm animals on Sullivan’s Island, South Carolina, Zed graduated from the University of South Carolina with a BFA in painting and sculpture. Shortly thereafter, she moved to Richmond and, later, Gordonsville, Virginia, where she lives and works today. Zed’s studio practice is eclectic and varied. Often starting with images from her sketchbook, she may develop some of these concepts into paintings and others into sculptural tableaux or installations. Her subject matter is nothing less than the sum of human civilization, with an emphasis on our relationship to the animal kingdom. 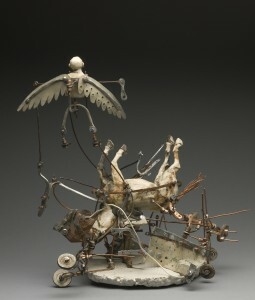 Human and animal figures collide with furniture or landscapes; rabbits sprout wheels or wings, while horses drown in collapsing scaffolding. Zed’s dreamscape narratives probe the inner reaches of the subconscious mind. Although Zed’s work derives much of its meaning from literary associations, her imagery teems with invention and startling leaps of imagination. Her visual poetry conjures a world in which logic and rationality take a comfortable backseat. Human foibles and impulses are placed in the foreground. And even though she works in different media, her conceptual approach remains consistent throughout. Derived from the title of one of the artist’s works, Keeper’s Keep alludes to British usage of the term “keeper” for “curator,” and plays on the double meaning of “keep” as both noun and verb. Aggie Zed is a storyteller whose works take us out of our consensual reality and into a world filled with absurdity, ambiguity, and the gifts of artistic imagination.